A brand intelligence tech start-up company backed by Queen’s University Belfast has been crowned ‘best tech start-up’ at the ITLG Silicon Valley Global Technology Forum. 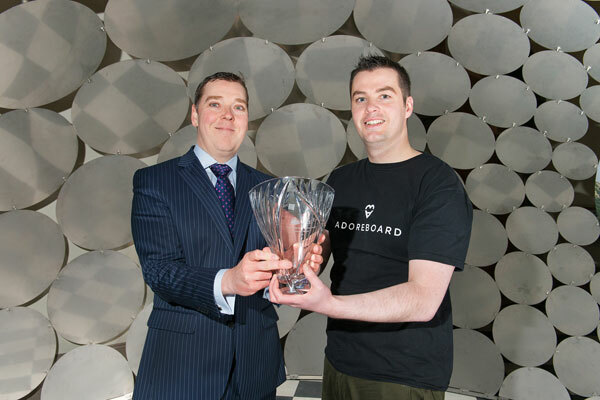 Adoreboard scooped the Irish Technology Leaders Group (ITLG) University Challenge Award for best tech start-up with the most global commercial potential at the recent awards ceremony. The company beat off stiff competition from over 20 third level institutions from across the island of Ireland in a Dragons Den style pitching competition. Last year another Queen’s spin-out company, Analytics Engines, won the Emerging Technology sector at the Awards. The Adoreboard award was made as part of a two day technology forum, where a delegation from Silicon Valley, which included top executives from the global tech sector including CISCO, Intel, DELL, Disney and AOL, met with a shortlist of start-up companies from across the island of Ireland who pitched their innovative technology solutions to an investor panel. The data analytics software company, which extracts meaning from big data to help brands understand how people feel about them online, faced a panel of seasoned enterpreneurs and corporate leaders including Barry O’Sullivan Senior Vice-President of CISCO. The Adoreboard leadership team includes Chief Scientific Officer Dr Gary McKeown from Queen’s University and Chief Technology Officer Dr Fergal Monaghan who previously worked at German software giant SAP.